Janet Morton is particularly fascinated by art’s ability to transform common objects – and she accomplishes this transformation with apparent ease and a surprisingly light touch. Morton duplicates objects from the everyday world and through the process, infuses them with desire. This fetishizing process is so inherent in the materials and procedures used to create her sculptures as to be indistinguishable from them. 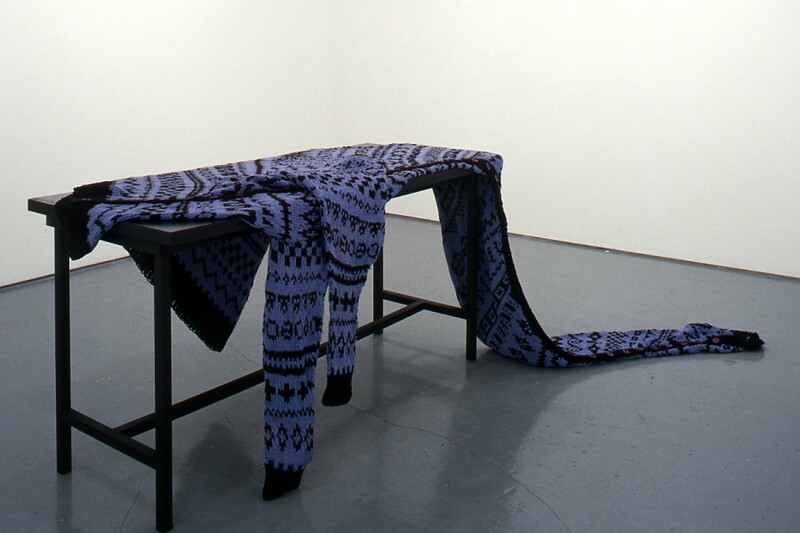 Knitted out of wool, immediately associated with warmth and intimacy, the objects are enlarged to a monumental scale. Their casual display, however, undermines the possibility of their own indulgence. 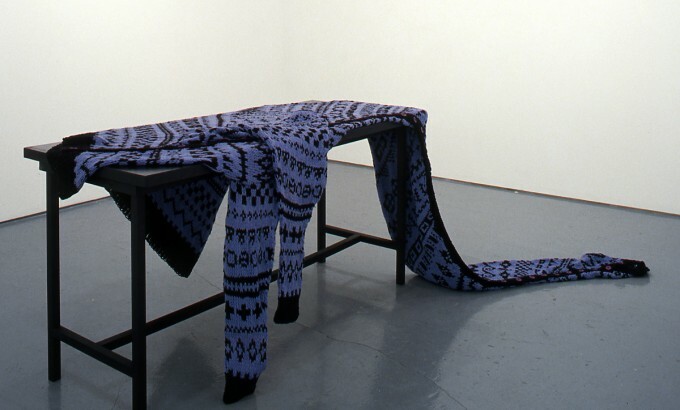 Work Sock (1992) a sixteen foot sock, is a sort of lovingly ironic monument to Canadiana. Her use of exaggeration to engineer an examination of the mundane recalls Claes Oldenburg’s giant art works. Closer to home, it is also strongly reminiscent of those jumbo icons found on the Trans-Canada Highway: Sudbury’s Big Nickel or the Giant Canadian Goose in Wawa. This latest work, Cardigan, is similarly excessive. It begins with images like those of coiffed poodles in sweaters – extravagances which are elaborations of pet owners personal style, functioning to extend possession in yet another manner. Cardigan takes such anthropomorphizing gestures to an extreme, allowing for an examination of the misdirected sentimental impulses behind them. Knitted for a giraffe in the Metro Toronto Zoo, the work literalizes a similar cultural operation; one which presents nature in a manner determined by human expectations and desires. 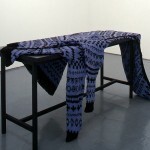 Produced through a repetitious activity somewhere between work, leisure and an expression of affection, Morton’s knitted sculptures carry ironic traces of all these associations.